Guide to Business Etiquette 2 Edition A brief, professional, reader-friendly guide to understanding business etiquette. 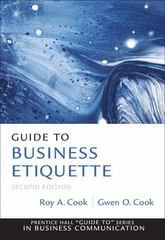 Put your best professional foot forward with Guide to Business Etiquette, a brief text that covers all the important issues and concepts without confusing the reader with excess material. This edition now covers basic digital etiquette and provides information on how to maintain business relationships.